Harry Potter author JK Rowling revealed today that she is dreading having to close the final chapter of her seven-part saga about the boy wizard, but the multi-millionairess said she was excited about possibly taking on an assumed name and penning new works as an anonymous writer. In an interview with a child fan the day after the hugely-anticipated launch of the sixth instalment of the Hogwarts’ wizard tale, Rowling said she would be tackling the final chapter of the story as early as the end of the year. And she hinted that there are plenty of clues in the latest novel, The Half-Blood Prince, to give eagle-eyed fans a clue of what is in story for hero Harry in the closing pages. Rowling granted her only British TV interview to teenage Potter fan Owen Jones, who won the chance to chat to the author in an ITV quiz. 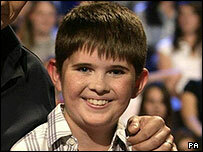 Owen, 14, from Cardiff, was shortlisted from thousands of fans after judges picked his list of questions for her. And in her interview Rowling admitted she had mixed feelings about ending the epic saga. She told Owen: “I am dreading it in some ways. “I do love writing the books and it is going to be a shock, a profound shock to me. “Even though I have known it is coming for the past fifteen years, I have known that the series would end, I think it will still be a shock. New mother Rowling said she would be taking some time off to care for her daughter, six-month-old Mackenzie Jean, before tackling the seventh, and last, Potter episode. Answering Owen’s questions on when she will start the next book, she said: “Not until the end of this year, beginning of next year. She added: “When people have finished reading this book, they will really know what to expect in book seven and I think I give very clear pointers as to what Harry will do next. With the end in sight for the tales of the now-16-year-old Harry, Rowling admitted she would quite fancy borrowing a cloak of invisibility from her own pages to escape some of the massive worldwide fame she has attracted with the record-breaking books. “A fake name is very attractive,” she admitted. “I’ll have less pressure and I can write any old thing I want and people won’t be clamouring for it and that might be nice. “I get asked a lot whether I would write another series, I don’t know because the thing that interests me about Harry Potter was not the fact that it was a series, it was just the story and the subject matter, so I could do a one-off, could do a series, I don’t know. “I cannot complain at all, what a fantastic thing Harry Potter has given me. The Potter books have been translated into more than sixty languages, with the latest edition heading for sales of more than two million in the UK and ten million worldwide already. The first five Harry Potter books have sold more than 265 million copies in 200 countries and have been translated into 62 languages. Thousands of bookworms queued through the night in Britain to get their hands on the latest adventure, expected to become the fastest-selling book in history. But despite her faith in her work, Rowling admitted she had been shocked by the scale of her success. With all the furore surrounding the latest book, security was tight, with Rowling even taking out an injunction against two Northamptonshire men accused of stealing two copies of the book to try to sell to a national newspaper. And bookmakers suspended betting on the identity of the character to be killed off in the Half-Blood Prince, amid fears that the manuscript had been leaked after thousands of pounds were laid on the Hogwarts headteacher, Professor Dumbledore. “What do you think you have gained from keeping the plots such a secret?” asked Owen. Rowling replied “I gain nothing but the satisfaction of knowing that all my hard work goes to the people for whom it is intended. In other words, people who really want to read the books, and I definitely believe that 99.9% of my readership would rather read the books and find out for themselves. Owen interviewed JK Rowling on Harry Potter At The Castle broadcast on ITV1 this evening. He and his mother Allison, 38, won a quiz on ITV1 and the teenager said he had been “swotting like mad” for the event ever since. He said today: “I was so excited to meet JK Rowling and to get the chance to ask her all about the books. :: As well as his own requests, Owen managed to pose a few questions for some well-known Potter fans, including Chancellor Gordon Brown and pop star Lemar. :: Lemar asked if she could teach any subject at Hogwarts what would her specialist subject be? She said: “My specialist subject would definitely be Defence Against the Dark Arts, I think. “I used to think transfiguration, but these days I’m thinking Defence Against the Dark Arts is a more worthwhile subject, exactly. Rowling answered: “I have occasionally let off steam by writing conversations between the characters that could not, I knew full well weren’t going to be published. And then I would just delete them and throw them over my shoulder and carry on. “Occasionally they would be quite rude to each other and rude in the other sense and em, yeah, that’s always a way to vent some of your frustration. © Thomas Crosbie Media, 2005.